Given the history of Israeli-Palestinian relations alongside the current policies of the Netanyahu administration, the recent Gaza episode can be viewed, in part, as one manifestation of a broader Israeli policy aimed at preventing Palestinian political unity and, by extension, preventing the materialization of an independent and sovereign Palestinian state. Before the Israeli annihilation of swathes of Gaza in July and August of this year, Hamas and Fateh (whose relationship is currently on the verge of collapse) were in the midst of political reconciliation with the hope of forming a unity government. Since then, new developments on the ground have begun to clarify Israel’s policy position towards the Palestinians. The 1999 charter of the Likud party (the party to which Netanyahu belongs) in fact clearly stated that “The Government of Israel flatly rejects the establishment of a Palestinian Arab state west of the Jordan river” while the far-right Israeli political party Yisrael Beiteinu, today, make the same claims. These declarations are perfectly in line with former Israeli policy towards the West Bank which has culminated in the confiscation of about 50% of the West Bank through a number of bureaucratic, military, and other court rulings over the past four and a half decades. Additionally, there has been constant settlement-building throughout the West Bank which, according to some of the latest Israeli Interior Ministry figures, puts the Israeli settler population at 375,000 which does not include an additional 200,000 Israeli settlers in annexed East Jerusalem. This means there is more than a whopping half-million illegal Israeli settlers living among the 2.4 million Palestinian Arabs in the West Bank and East Jerusalem. Like several previous Israeli administrations, Netanyahu’s has been actively seeking to destroy the chances for Palestinian statehood by engaging in Israeli expansionism while simultaneously promoting Palestinian political disunity between the secular nationalist Fateh and the religious militant Hamas in attempt to preserve the status quo (i.e. military occupation, control of resources, borders, populations, etc.). In some instances, Israel acted as an encourager of Hamas’s growth and expansion and provided the social welfare organization/charity-turned-political party access to donations and money from the international community which allowed it to develop a strong presence in Gaza and the West Bank in the late 1980’s and 1990’s. In other instances, it marginalized Hamas, fought them, and refused to negotiate with them. This suited Israel’s goals of postponing and preventing negotiations over statehood by claiming they would never negotiate with a terrorist organization (although the same rhetoric was employed by Israel in reference to the PLO and Fateh for years). This strategy was articulated by the 1993 Oslo Accords which Hamas was vehemently opposed to and which subsequently led to the creation of the Fateh-run Palestinian Authority which became the de facto Palestinian enforcer of Israeli occupation in the West Bank. This point has been made repeatedly by leading Palestinian-American historian Professor Rashid Khalidi. The late Professor Edward Said also offered up strong criticisms of Palestinian Authority President Mahmoud Abbas back in 2003. Nevertheless, early support of Hamas served Israel’s long-term political strategy which was predicated upon the idea of, quite simply, dividing Palestinian society, fragmenting it politically, and strangling it economically. Ineptitude, rivalries, and the struggle for power among the Palestinian political factions led to a small-scale civil conflict in 2006-2007 (much of which took place in Gaza). After Hamas seized power in the 2006 Palestinian legislative elections, Israel refused to transfer $50 million in Palestinian tax revenues to Fateh (which was no longer the representative government) unless Hamas agreed to several political stipulations which essentially amounted to being more like Fateh, i.e. de-militarized and pacifistic. 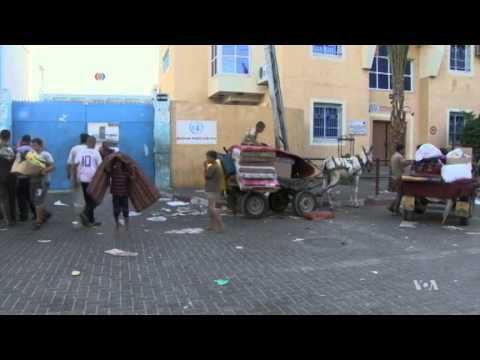 Hamas’s rejection led to a loss of aid from international donors (U.S., E.U, etc.) leading to a major financial crisis in both Gaza and the West Bank, and as institutions began to crumble, so did Palestinian unity. The issue of unity, again, has come to the forefront. On Sunday (September 7), P.A. President Mahmoud Abbas (whose presidency expired in 2009) criticized Hamas for its seemingly counter-conducive behavior during the Israeli bombardment of Gaza and urged the democratically elected government to relinquish power there or face a dissolving of the two group’s political alliance. The most recent events in the Palestinian territories which include the war on Gaza that killed 2,100 Palestinians, Israel’s recent ‘appropriation’ of 400 hectares (about 1,000 acres) of land in the West Bank for ‘state use’ , and Mahmoud Abbas’s threats to Hamas are all manifestations of an ongoing Israeli campaign to prevent the emergence of an independent and sovereign Palestinian state in the West Bank and Gaza by keeping the weak, ineffectual, and corrupt Fateh in control of Palestinians since the organization has essentially, since Oslo, played the role of Palestinian handmaiden of the Israeli occupation. Now, pressure is mounting on the increasingly despotic Fateh to re-claim authority in Gaza while the Israelis may be hoping that its most recent war there should delegitimize Hamas in the eyes of its constituents and help turn an increasing number of Palestinians against the militant regime. However, the failures of the Palestinian political parties to establish an all-encompassing, efficient, stable, and truly representative government in the Palestinian Territories undoubtedly helps Israel achieves its geo-political objectives and creates conditions that make it increasingly easier to export and implement their military, economic, and political policies there. In essence, Fateh (and to some degree, the same can be said about Hamas), with the tacit support of Israel, prefers to remain in power at the expense of Palestinian sovereignty. To the Israelis, the prevention of Palestinian independence is intimately tied to the destabilization of internal Palestinian politics and the Palestinian leadership’s complicity in the matter will equate to a perpetuation of instability and quite possibly, the death of Palestine as both an idea and as a potential nation-state. Tareq Ramadan is a PhD Candidate specializing in Arab and Islamic Studies and teaches classes on Middle East History and Contemporary Arab Society at Wayne State University in the U.S. In this piece, he argues that Israel’s most recent military assault on Gaza is reflective of a broader policy aimed offsetting an imminent energy crisis through the destabilization of Palestinian politics and the acquisition of Palestinian gas reserves off the coast of Gaza.